Mish's Global Economic Trend Analysis: Illinois Supreme Court Rules 2013 Pension Reform Law Unconstitutional; Chicago Teachers "Insulted by 7% Pay Cut Offer"
Illinois Supreme Court Rules 2013 Pension Reform Law Unconstitutional; Chicago Teachers "Insulted by 7% Pay Cut Offer"
Pension news out of Chicago keeps getting worse. 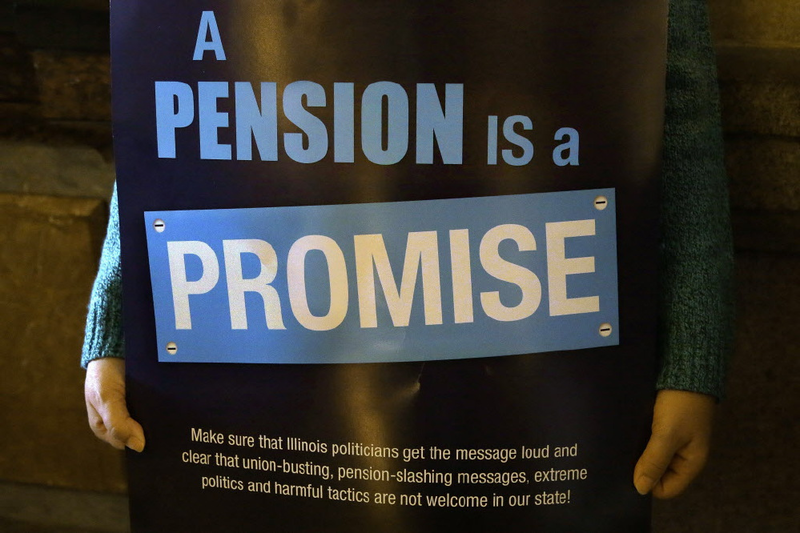 In 2013, the Illinois legislature took a feeble stab at fixing some small aspects of the Illinois pension problem. The legislation, signed by then Governor Pat Quinn reduced the 3 percent compounded cost-of-living adjustment for retirees established in 1989, raised the retirement age for workers 45 and under, and imposed a limit on pensions for the highest-paid workers. That was a step in the right direction, albeit a small one. Today we learn the Illinois Supreme Court Finds 2013 Pension Reform Law Unconstitutional. On Tuesday, I noted the dire state of Illinois pensions on CNBC with Rick Santelli. (See Chicago Board of Education to Default on Bonds? Rick Santelli and Mish Discuss on CNBC). Illinois pension underfunding estimates range from $130 billion to $200 Billion. Those numbers assume two things. Assumption number 1 just went out the window. It is my strong belief that assumption number 2 will soon follow. I expect returns in stocks and bonds over the next seven years to be negative! For further discussion as to why, please see Valuations: Maybe I am Crazy. On top of the already mounting fiscal issues, and in spite of the fact the Chicago Board of Education has a $1.5 billion hole, Chicago Teachers 'Highly Insulted' Over Request for 7 Percent Pay Cut. The Chicago Board of Education wants teachers, social workers and other union members to take a 7 percent pay cut by paying their own pension contributions, according to the Chicago Teachers Union. CTU President Karen Lewis, who led her members to strike in 2012 for the first time in 25 years, accused CPS of being “broke on purpose” and of retaliating against the union for opposing the mayor in his recent re-election campaign. “Once again, the board has created a fiscal crisis in order to justify its continued attack on our classrooms and communities. By citing its so-called $1.5 billion deficit, the mayor is proposing a reduction in teaching staff which will result in larger class sizes and the loss of teaching positions,” Lewis said in a press release. “The CTU is highly insulted,” said union spokeswoman Stephanie Gadlin, who planned a press conference on Wednesday. In what alternate universe is Karen Lewis living to believe this is a manufactured fiscal crisis? How is a state that has a $9 billion budget deficit hole going to bail out a single school district that is $1.5 billion in the hole? Today's ruling more than ever shows the need to pass a bankruptcy law. I have been pushing for that as has Governor Rauner. A May 5 Chicago Tribune editorial viewpoint said the same thing: Pass a Bankruptcy Law, Give Taxpayers a Chance. Finally, a law that puts bondholders first in line to get repaid would be a stroke of fairness that would help Illinois cities, school districts and other local governments avert a short-term solution like Detroit's. Census QuickFacts shows there are 4,772,723 Illinois Households as of 2013. To be generous, let's round that up to 5 million. Let's also ignore my dire prediction of negative gains for seven years while placing the underfunding level at $200 billion. To make the funds actuarial sound, Illinois households need to come up with $40,000 each. If instead of assuming 7% returns one assumed 2% returns (yield on the 10-year bond), the hole is closer to $500 billion. And what if the stock market dives 30-40% over the next two years as I believe likely? A promise is a promise, not an eternity. Marriage is a promise as well. And this promise was not even an honest one. Contracts made under coercion and threats are not even valid. But even valid contracts can be broken. That is precisely why we have bankruptcy law instead of debtor's prisons. In this case, corrupt politicians made bargains with corrupt union leaders at taxpayer expense. Unions further contributed to the mess with coercion and threats. Any sensible person knew these promises could not be met. The result of the unholy alliance between corrupt union leaders and corrupt politicians was a shotgun marriage made in hell. Taxpayers need to sue for divorce. The way to do that is bankruptcy court. I repeat Miracles Not Coming; Bankruptcy the Sensible Option.